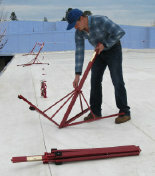 to meet OSHA safety requirements for roofing contractors. Our products are engineered to be durable, easy to use, and to increase production. They are available factory-direct and through your favorite distributor.